Sapphire has excellent optical qualities and transmittance over a wide spectral range especially the infared. 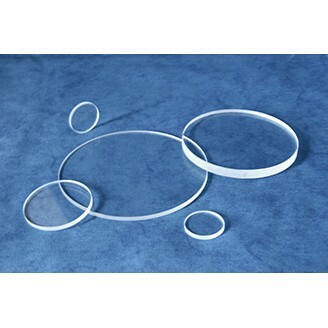 It has a low coefficient of thermal expansion and low flourence, good resistance to thermal shock and scratching making this an excellent material for IR tranmitting optics and robust applications. We can offer Sapphire with Random Orientation and C cut Sapphire to axis-Zero degree. A large range of diameters, thicknesses, chamfers, steps and bevels are available in a polished finish. Please use our enquiry form to let us know exactly what you require. Sapphire Polished Disc - 14mm dia. Sapphire Polished Disc - 25mm dia. Sapphire Polished Disc - 25.40mm dia. Sapphire Polished Disc - 30mm dia. Sapphire Polished Disc - 36mm dia. Sapphire Polished Disc - 38mm dia.